Massachusetts Flower Growers' Association | Massachusetts Grown for Massachusetts Gardens! Looking to stock your shelves with seasonal products? Click the image to search our member directory and find exactly what you need! Our website provides consumer information and an onsite search of MFGA members' retail local independent garden centers and farm stands. Click here to learn about the benefits and resources you will have access to! Flower Growers Winter Meeting and Education Program Northeast Nursery, 8 Dearborn Road, Peabody, Massachusetts Sponsored by the Massachusetts Flower Growers’ Association and University of Massachusetts Extension Greenhouse Crops and Floriculture Program Registration includes lunch! Registration must be received by February 8, 2019. Click here for a downloadable pdf that includes the registration form and complete […]Learn more. . .
On June 3, 2015 the National Pollinator Garden Network (NPGN), an unprecedented collaboration of national, regional, conservation, and gardening groups, launched the Million Pollinator Garden Challenge. This is a strategic effort to promote and protect the needs of pollinators in North America. In the fall of 2014, AmericanHort and seven other organizations were convened to […]Learn more. . .
EEA Secretary Matthew Beaton Celebrates with Tree Planting at Elementary School CHARLEMONT– May 15, 2015 Governor Baker has proclaimed today, May 15, 2015, “Plant Something Day” to support the Commonwealth’s many flower and nursery growers. In celebration, Energy and Environmental Affairs (EEA) Secretary Matthew Beaton and Department of Agricultural Resources (DAR) Commissioner John Lebeaux joined […]Learn more. 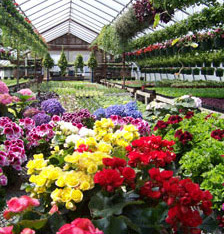 . .
Massachusetts has one of the largest greenhouse flower producing industries in the nation. It currently ranks within the top 20 states in the wholesale production of ornamental plants. These include potted and hanging plants, bedding plants, perennials and cut flowers.